In this case, the expression “Mind the Gap” is referring to the store “The Gap.” I’m sure Chloe and Ella will know why I’m using this expression, at least once they see this picture. Right, girls? You see, Melinda was laboring over what to bring Celeste & Claire from the U.S. as gifts. In desperation, she “allowed” Chloe and Ella to make the decisions, sending them out late last week with the task. They went to The Gap and came back with four items. Now the question was, which two items went to each girl? Last night this was settled as Melinda explained that one girl got to pick first and the other girl got to pick second and third, meaning the girl who picked first also got the fourth item. Initially, Celeste, age 13, was going to pick first, but ultimately Claire, age 11. did so. I’m sure some sisterly strategy was involved. 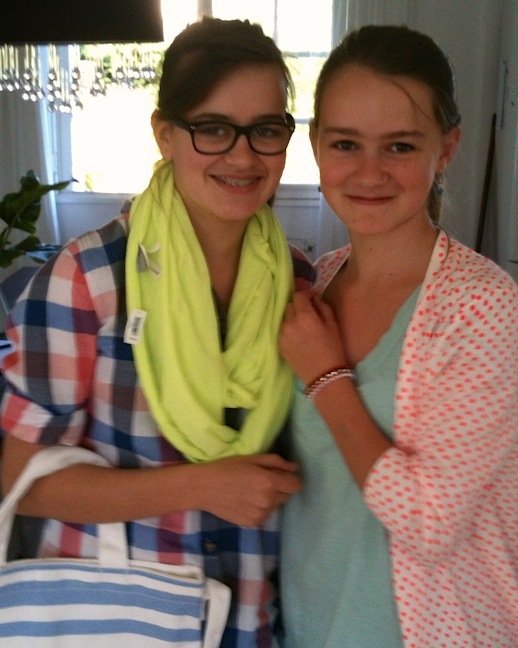 For those of you scoring at home, Claire picked the sweater, whereupon Celeste selected the scarf and bag, leaving Claire with the bracelet. I don’t think draft picks, future considerations, or cash was involved.